A heat allocator is a device that measures the consumption of thermal energy to calculate heating costs. It is more accurately described as an auxiliary device as it does not measure any physical parameters (such as litres or grams), but displays mathematical algorithms. They represent a proportional amount of the total heating consumption for the whole building. It therefore stands to reason that the total consumption of an individual flat can only be calculated taking into account the values expressed by the other allocators installed in the rest of the flats in the building. How does an allocator work? Essentially, allocators measure the amount of energy emanated from every single radiator. A panel of conductive material located on the back of the device transmits signals to the allocator related to the energy consumed by the radiator. This happens using two main methods: allocators that work on the principle of evaporation and electronic allocators. The latter group also includes radio allocators. Evaporative heat allocators contain a capillary tube at the rear, which is open at one end. The heat from the radiator evaporates the liquid contained in the tube. The liquid evaporates in proportion to the amount of heat given off by the radiator. The radiator’s energy consumption can therefore be determined by measuring the degree of evaporation. Electronic allocators may be equipped with one or two thermosensors. Both consist of a component made from a conductive material located on the bottom of the allocator, an electrical circuit and a LC display. A single-sensor system measures the surface temperature of the radiator. In this case, the room temperature is determined by setting the device at a constant temperature. 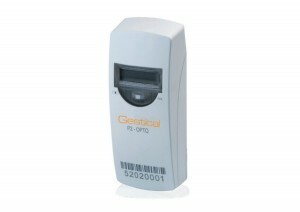 These devices are also available with a double-sensor system, in which the first sensor measures the temperature of the radiator and the second sensor measures the room temperature. Consumption is then calculated based on the difference between these two temperatures. The devices can also be programmed individually for each radiator. Radio heat allocators differ from standard allocators in that the data is transmitted by radio. The greatest benefit for users in this case is that they do not need to be at home for the reading. Heat meters measure thermal energy (heat) in kilowatt/hour or megawatt/hour. They are installed directly on the heating conductor and are composed of a volumetric part integrated with two temperature sensors and a calculation unit. All devices sold must possess the certification currently required by law in the country in which the device is sold. How does a water meter work? 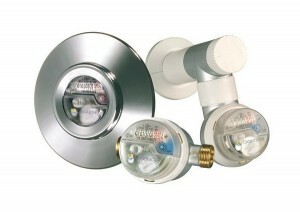 The water meters are mounted on the respective pipelines (hot or cold domestic) in the apartment and in a separate house. The water circulation activates the counter which thus shows the consumption (in liters or cubic meters) through a turbine rotor (with power or jet) technology. The water meters are mandatory calibrated (certification EN). 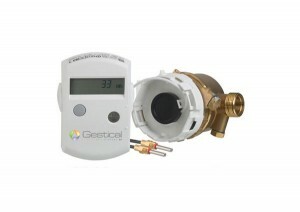 They are available for the cold and hot water, in the mechanical or electronic version.